Simulation of today’s full Moon using NASA satellite data. 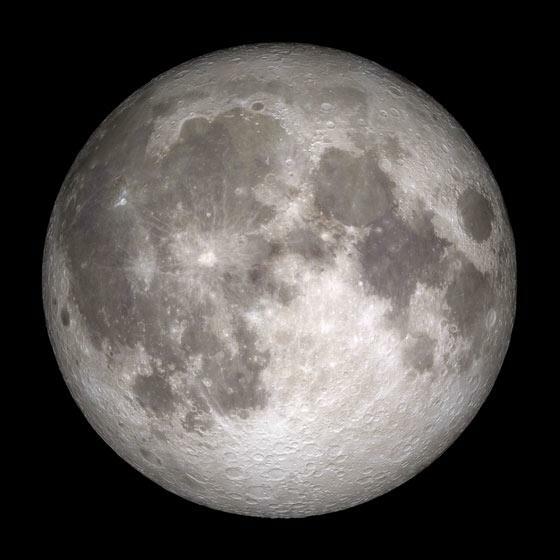 Today, Dec. 28, 2012, marks a somewhat infrequent and cool event: the 13th full Moon of the year. Technically, the Moon was most full at 10:21 UTC (04:21 Eastern US time this morning), but will appear full to the eye all day and night. It rises at sunset no matter where you are, and stays up pretty much all night. So what’s the big deal? Well, to be honest, it’s more of a mathematical curiosity than anything else. First, if you want to know why we have phases of the Moon in the first place, it’s not due to the shadow of the Earth on the Moon! That’s actually a common misconception. If you’re in a spacecraft, you can see both the Earth and Moon phases. 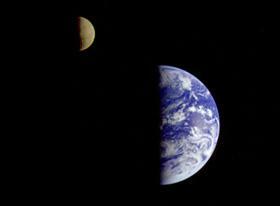 This is our planet and Moon as seen by the Galileo spacecraft on its way to Jupiter in 1992. In reality, it has to do with the angle between the Sun, Moon, and Earth. Basically, the Moon is a sphere out there in space, with half being lit by the Sun. As the Moon moves around the Earth once per lunar orbit (and the angle between the Moon and Sun changes), we see different amounts of the Moon being lit. Sometimes we see the half that’s dark (when the Moon is new), sometimes the half that’s fully lit (the full Moon), and sometimes in between. There are approximately eleventy billion web sites about this; here’s a video that explains it pretty well in five minutes. The time it takes from the Moon to go all the way through its phases—called the Moon’s synodic period—is 29.531 days, or 29 days 12 hours 44 minutes. That’s just about a month, and in fact is where the word “month” comes from (think “moonth”). So you might expect to get 12 full Moons every year, and you’d be close. A year is about 365.25 days, so there should be 12.37 full cycles of lunar phases a year (dividing 365.25 days per year by 29.531 days per lunar cycle), which means 12 full cycles—so 12 full Moons—plus a little bit, about a 1/3 of a cycle more. But that extra bit is important. That means the cycle of phases and the length of the year don’t line up. At the end of one year you have about 1/3 of a cycle left over. By the end of the second year, you have twice that much, or 2/3. That means the third year has a full cycle left over, so you get a 13th set of Moon phases for free. Here’s another way to think of it: If we had exactly 12 cycles per year, we’d have 36 cycles every three years. But really we have 3 x 12.37 = 37.1, so we get an extra cycle every three years or so. 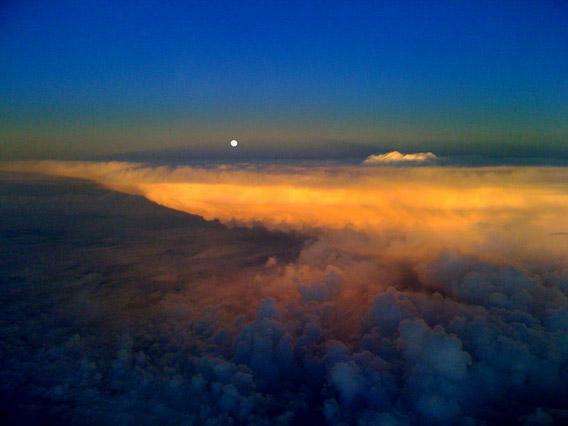 Moonrise from an airplane at 45,000 feet. Note the color of the clouds; the Sun was setting as the full Moon rose. Image credit: Bily Derbyshire, used by permission. And here we are! 2012 is the year for that. Tonight’s full Moon is the 13th of the year. There are a couple of more things this means, too. For one, if we have 13 full Moons in one year, there must have been a month that had two full Moons in it! This year, that happened in August, when there was a full Moon on both Aug. 2 and Aug. 31. The second full Moon is commonly called a Blue Moon. That’s just a nickname; it’s not really blue, and using it to mean the second full Moon in a month is a relatively modern custom. Here’s something else that’s kinda nifty: If the full Moon occurs on or before January 10, then there will be 13 full Moons in a year. Like I said, the cycle of Moon phases is 29.531 days. That means you get 12 full Moons in 354.37 days (12 x 29.531), which is about 10 days less than the length of a year. So if the full Moon happens between Jan. 1 and Jan. 10, there’s enough time left in the year to get a 13th full Moon. That also means it has to happen after Dec. 21 or so. By the way, the last time we had 13 full Moons in a year was 2009, when the 13th full Moon happened on—get this!—Dec. 31. Since, like I said, the 13th one has to happen between Dec. 21 and the 31st, a New Year’s Eve full Moon does sometimes happen. In fact, it happens once every 19 years, when the lunar cycle matches up with the length of the year—19 years is almost exactly 235 lunar cycles (19 x 365.25 is very close to 235 x 29.531)—which is called a Metonic cycle. The next New Year’s full Moon will be in 2028…which, amazingly, will also coincide with a total lunar eclipse. Incidentally, if the full Moon happens on Dec. 31, then it must also happen on Dec. 1 or 2, making a New Year’s Eve full Moon the second full Moon of the month, so it’s also a Blue Moon. Phew! I could go on, but that’s probably enough. And now you have a head full of the cool nerdy math that goes into this. I love this stuff; the whole Universe obeys a set of rules that makes a lot of it predictable and understandable. Once you see that, it’s hard not to be amazed and awed by it. The more you know, the more amazing it gets. And that feeling never goes away. I’ve been in love with all this for years. So trust me: It’s not just a phase. 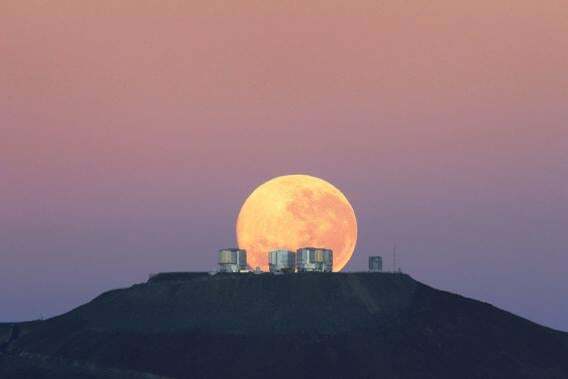 Moonset over the Very Large Telescope Observatory in Chile. When the Moon is full, it sets when the Sun rises.